In case you haven’t noticed, we have a lot to celebrate these days! 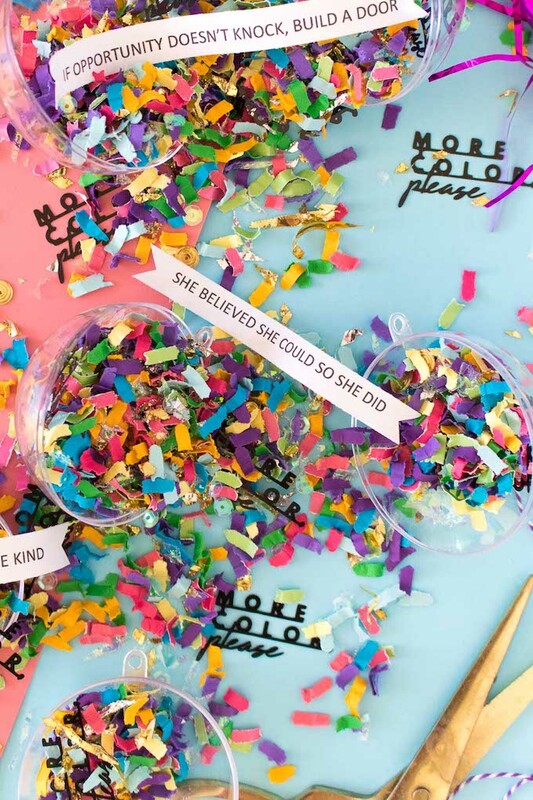 What better way to keep the party going than with confetti?! And what better way to start a Monday, am I right? 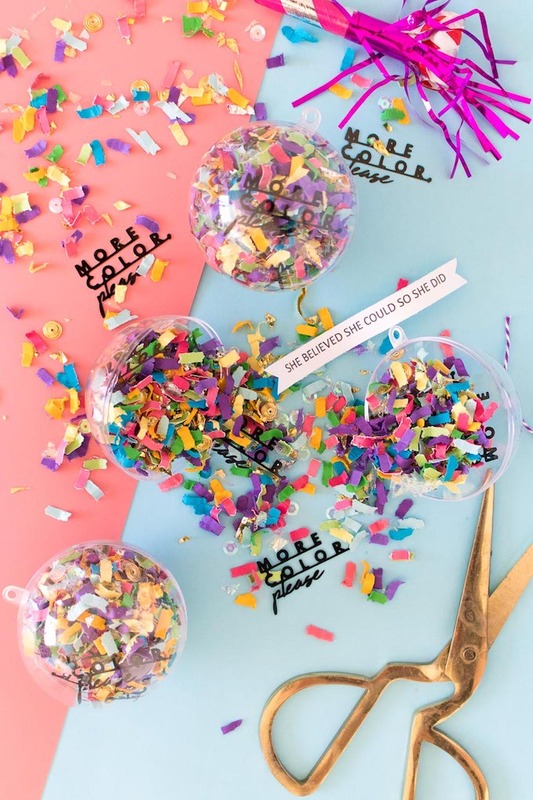 I believe that every party needs a little confetti, especially in the form of these DIY confetti surprise bombs filled with secret messages. 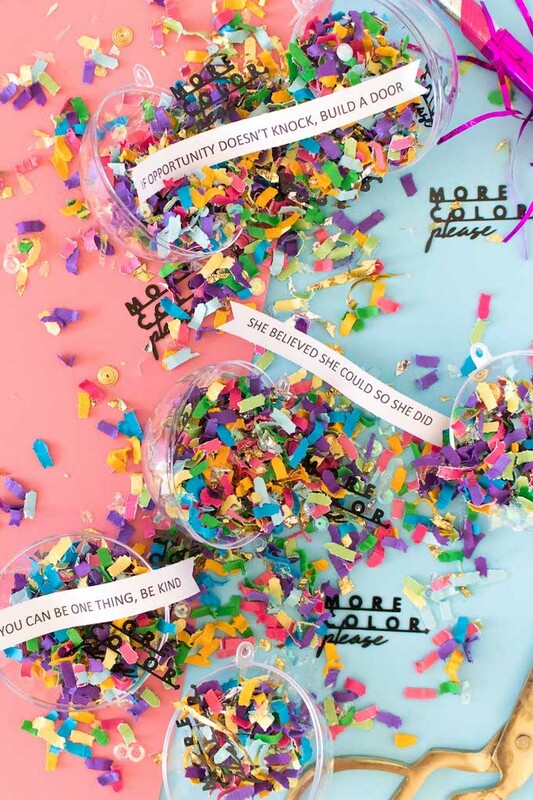 And especially when it’s as colorful and fun as this “more color, please” confetti (which you can buy here!). 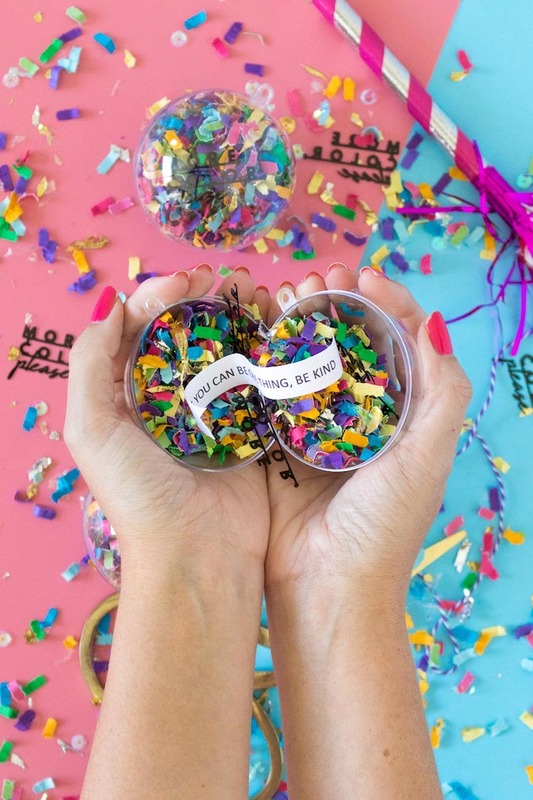 Hide pieces of paper with quotes or messages or even small items in the middle of a ball of confetti, and it’s a nice surprise when you pop them open to release a “bomb” of confetti. You could even turn them into Christmas tree ornaments! You might recognize these sweet quotes from our Wednesday Words of Wisdom series. 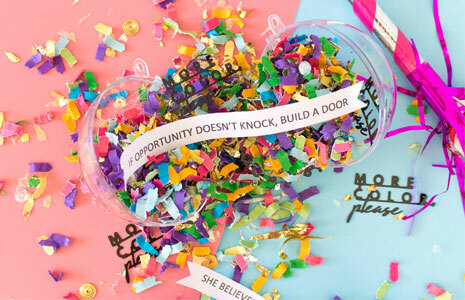 Think of these like confetti filled fortune cookies and go wild with surprises and colorful confetti! Step 1: Cut the quotes into thin strips and curl gently around your fingers to condense the size so that they’ll fit inside the ornaments. Step 2: Open the ornament in half and add a little confetti to one half. Place the curled paper in the middle and top with a large mound of additional confetti. Carefully place the other half on top and snap in place. It should be very full so that you can barely see the paper inside. 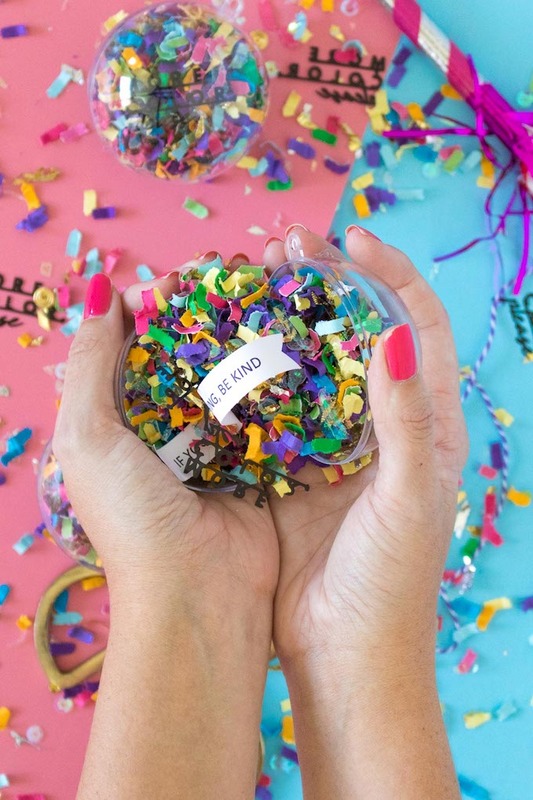 When you’re ready to open the confetti bombs, place a hand on either half of the ornament and pull to let the confetti explode out and reveal the surprise message inside. 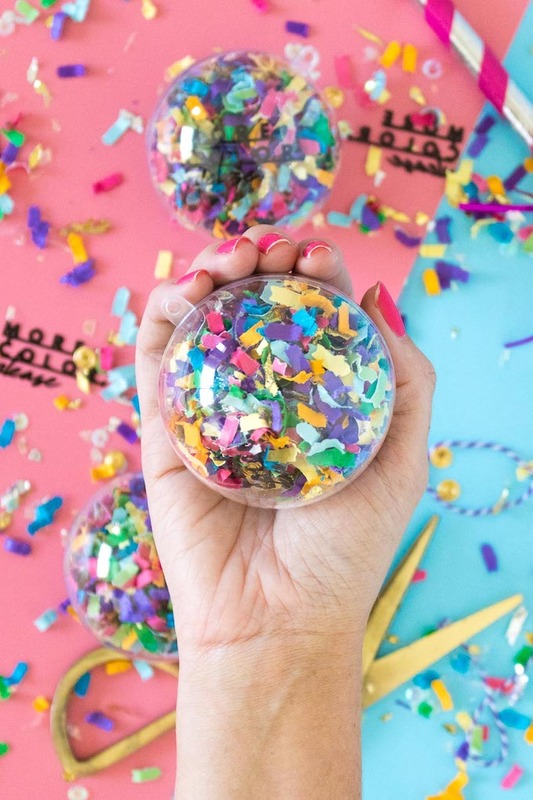 It might make a mess, but confetti is too much fun to worry about messes! How fun, right?! Let us know if you end up making these. Have a great rest of your day, and be sure to check out today’s look. And we’ll see you tomorrow for a really exciting post — we’re going behind the making of our “more color, please” wall, including an interview with Mr. D himself, our first video (!! ), which is a very cool time lapse of the day, and we’re bringing you an update to the Houston Mural Guide! Lots of good things. See you then! Do you think you know Coach? Think again!